Protest to be held on Monday to support LGBT people in Chechnya | SHEmazing! Activists are gathering in Chechnya following reports of mass arrests, torture and murder of LGBT people in the Russian republic. A complaint has been filed by activists in the gay and trans communities who are demanding that Russian authorities open a criminal investigation into the reported homophobic campaign by security forces. The LGBT Network, a St Petersburg-based organisation, stated that it submitted the complaint to the Investigative Committee, which is the equivalent of MI5 or the FBI. As a result, LGBT+ activists are gathering this Monday, February 4 at 6:30pm outside the Russian Embassy to show their solidarity with the Chechen gay community. Join us and other LGBT+ community organisations from across Ireland this Monday, February 4th at 6.30pm, outside the Russian Embassy in Rathgar as the Irish community stands in solidarity with our LGBT+ family in Chechnya. The The LGBT Network are demanding that the alleged detention or at least 14 people and death of one person be investigated, as well as probing claims of torture. The group are attempting to compel Russian authorities to act on the reported new wave of persecution targeting Chechnya's gay community, Chechnya is predominantly Muslin, and is ruled by the dictatorial leader Ramzan Kadyrov. In 2017, the campaign of hatred saw dozens of gay men rounded up and tragically tortured. Chechen authorities shockingly asserted that homosexuality doesn't exist in Chechnya, thereby denying the claims. Director of the LGBT Network, Igor Kochetkov, told ABC News that the 14 cases in the complaint only applies to one police station in the capital, but there are others being detained all over the country. The director said; "We believe several dozen people are detained, no lower than 40." His organisation helped dozens of gay men escape the country in 2017, and aided them in their search for asylum abroad. Police are reportedly seizing the victims' passports when they are detained in order to stop them from fleeing, according to Kochetkov. Unlike two years ago, this time women are also being detained. The Investigative Committee have declined to open a criminal case and rejected any appeals against the decision. In response, Irish groups such as; Amnesty International, BeLonG to Youth Services, Dublin Bears Events, Dublin LGBTQ Pride, FLAC, GCN, Dublin Gay Theatre Festival, Outhouse, ShoutOut, The Rainbow Project, USI, This is Me, the National LGBT Foundation and NUI Maynooth have pledged solidarity with the LGBT+ community in Chechnya. Groups and activists will gather this coming Monday in protest of the alleged treatment of gay Chechan people. They wrote on their event page; "Since December, violence and persecution against those perceived as being members of the LGBT+ community in Chechnya has escalated. 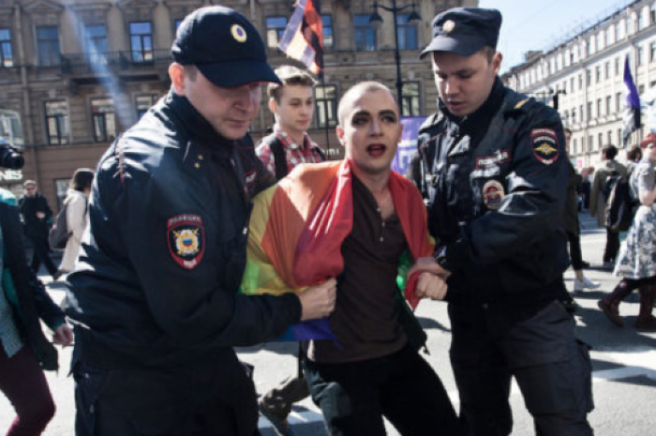 The Russian LGBT+ Network has reported that up to 40 people have been illegally detained, while a further two have died as a result of torture." "We are calling on the Irish government to officially respond to the human rights violations being perpetrated in the region," it continues. They are also making a list of requests for the Irish government and the United Nations. "We condemn the escalating violence against LGBT+ people and urge An Taoiseach, Leo Varadkar, to publicly condemn the anti-LGBT+ crackdown. The Irish Government must raise this issue at the highest possible level with Russian leaders and call for an immediate end to this harrowing persecution." 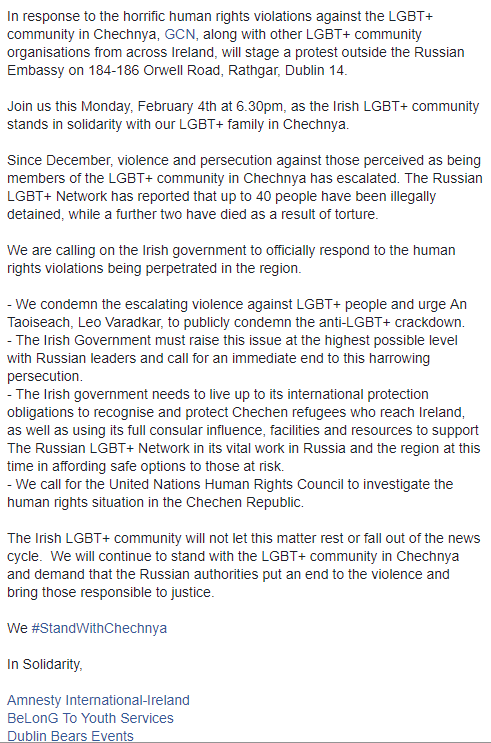 "The Irish government needs to live up to its international protection obligations to recognise and protect Chechen refugees who reach Ireland, as well as using its full consular influence, facilities and resources to support The Russian LGBT+ Network in its vital work in Russia and the region at this time in affording safe options to those at risk." "We call for the United Nations Human Rights Council to investigate the human rights situation in the Chechen Republic." They concluded with a rousing statement; "The Irish LGBT+ community will not let this matter rest or fall out of the news cycle. We will continue to stand with the LGBT+ community in Chechnya and demand that the Russian authorities put an end to the violence and bring those responsible to justice." The protest takes place this Monday February 4 at 6:30pm in Rathgar, outside the Russian Embassy. We'll see you there.